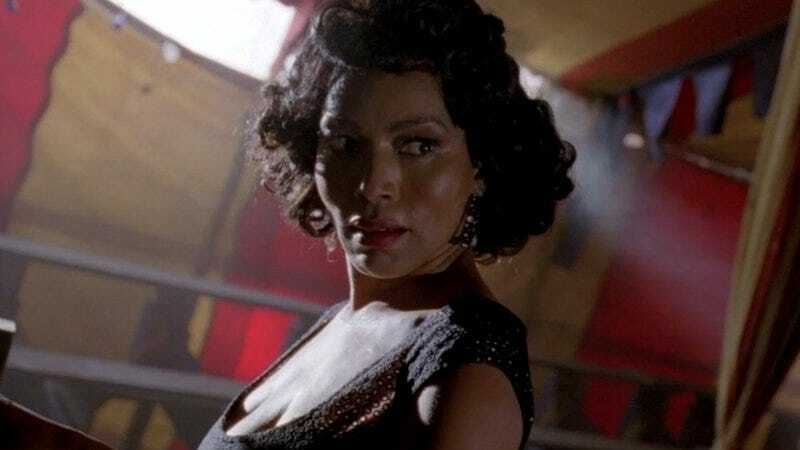 As part of the weekly effort to remind you that American Horror Story exists without giving you enough details to remember how disappointing it’s become, FX has announced that Angela Bassett will also be returning for its fifth season alongside so many other recurring players. That list so far includes Kathy Bates, Chloë Sevigny, Sarah Paulson, Evan Peters, Wes Bentley, and Matt Bomer—alongside new players Cheyenne Jackson and Lady Gaga. Bassett’s joining leaves only the possible returns of Lily Rabe, Frances Conroy, Denis O’Hare, Jamie Brewer, Emma Roberts, Taissa Farmiga, Danny Huston, and/or Zachary Quinto to fill out the next several months of squeezing news updates out of a series that doesn’t premiere until October, and will eventually make all the build-up seem sort of silly in retrospect. See you next week. On last season’s Freak Show, Bassett played Desiree Dupree, a woman with three breasts, two sets of genitalia, and zero interesting storylines. This season, Ryan Murphy tweeted that Bassett will be “making lots of trouble with Lady Gaga in the ballroom and elsewhere” on AHS: Hotel, suggesting maybe they’re going to be some sort of lounge act who kills people, or they’re dance instructors who are actually ghosts, or they are a couple of Laurel and Hardy-like knuckleheads who were hired by the stuffy concierge to clean the chandelier, with smashing results. It doesn’t really matter. Ultimately they will kill or be killed, while they or others stumble around drunk and sad that someone has been killed, until at last enough characters have died to call it a season. And then they’ll be back with different accents to do it all again next year.